The ‘servant’ ship will continue to bring hope to Singapore. 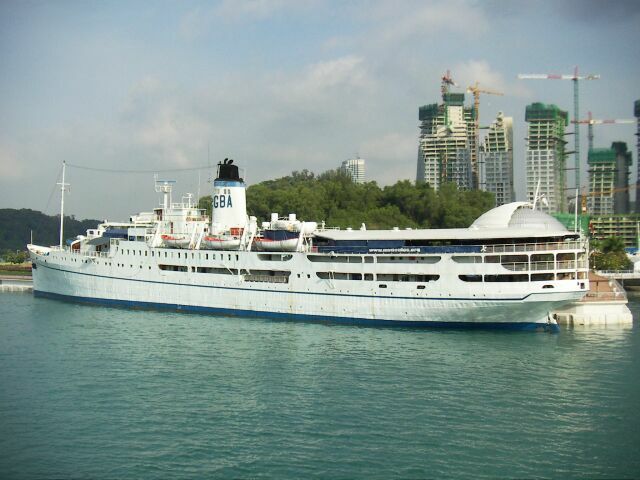 Ownership of the MV Doulos, listed as the world’s oldest ocean-going passenger ship, was officially transferred today to Christian businessman Eric Saw, Director and Chief Executive of BizNaz Resources International Pte Ltd in Singapore. Following the signing of official paperwork, a handover event celebrating the ship’s 32 years of service and giving thanks to God for His faithfulness took place on board the vessel at a shipyard in Jurong, hosted by the remaining crew including Captain Dirk Geuze, who recently joined the vessel during its extended time in Singapore, Harald Smit, Company Representative and Technical Manager, presently serving on board as Chief Engineer, the last Director of Doulos, Seelan Govender, as well as Mark Dimond, and attended by Eric Saw and a number of other invited guests. On Friday 19 March, Eric Saw will in turn host a thanksgiving dinner aboard his Stewords Riverboat. After renovations, Eric Saw plans to have the ship accessible to the public, but from a fixed berth. Even though the ship has avoided the scrap yard once again, it does now seem that her sailing days are over. 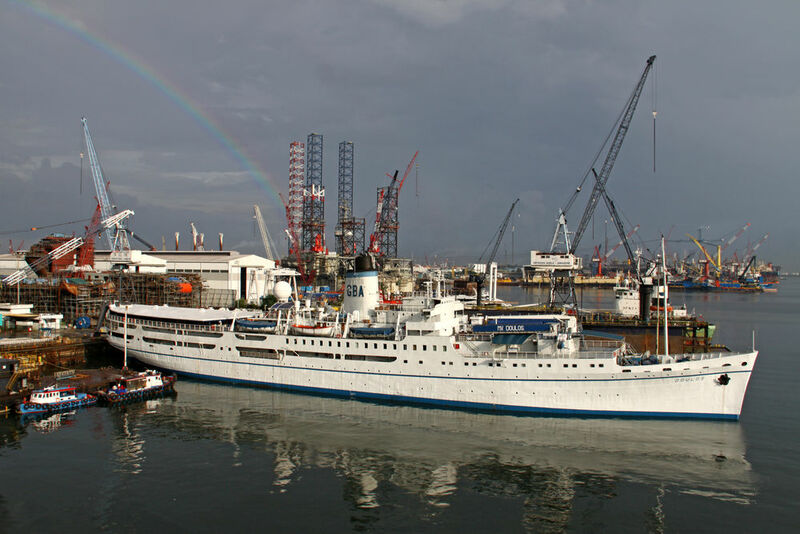 The plans include an exhibit on board telling the story of the ship’s remarkable history and roles as an onion carrier, coastguard vessel, migrant ship, first-class cruise liner and most recently, floating book fair and home to an all-volunteer international Christian community of over 300 people from around 50 countries. Eric Saw also operates the Singapore based ‘Stewords Riverboat’ (www.riverboat.com.sg), a non-motorized Mississippi-styled riverboat moored at the city’s Marina South Pier which is a venue for a wide variety of functions and events, including ‘Breaking Bread’, a café themed around Bible-inspired food and fellowship. OM Ships International continues to operate Logos Hope, launched into service in 2009 and presently serving the island communities of the Caribbean. For latest news and further information, visit http://www.omships.org. I always existed, as pure thought and energy. Alone and completely self-sufficient, I needed nothing outside myself to eternally exist. Yet at some point I chose not to be alone. I created immortal beings with the ability to think, learn, reason, make decisions, travel, and do work. Not identical to each other and none like myself, I made hierarchies of these creatures and gave them personality, power and purpose. Communication. Fellowship. Worship. For their habitation I created a place outside myself, efficiently designed to best serve their purpose and mine. The dimension of heaven. To facilitate communication, fellowship and worship, I made a space for myself within their habitation, creating one without danger of damage or destruction from my presence. Sounds okay, yes? God, angels, heaven. Seems complete to me. But it wasn’t, in God’s mind. Something more remained to be created. To facilitate the existence of this next being, the material universe, constellations, galaxies, solar systems, stars, planets, moons, movement, light and dark matter were created. Time and space. The habitat came first, then the human beings. Once again, God made creatures with the ability to think, learn, reason, make decisions, travel, and do work. And free will. But with a critical difference: beings created in God’s image and imbued with God’s essence… zoe: God’s life; eternity. Meditating on this one day, I asked: Why give them eternity? Why wouldn’t creating these personalities in God’s own image be sufficient? So we live for a while and then die, so what? We would never know the difference, how could it matter? Ah, but that’s the point. God’s own image is eternal. Without zoe, it’s not his image. Fast forward through the timetable of temptation, rebellion, sin, Christ, cross and redemption, to what I believe is a relatively near-future item on God’s agenda. A headquarters for God in all his personas – Father, Son, Spirit – combining the dimension of heaven with the dimension of earth. Before that happens, earth will undergo drastic remodeling, perhaps a thousand years of reconstruction. The powers (dunamis) of the present heavens (air, sky, everything from the dirt up) will be shaken (vibrate, waver). The original language in these verses from Matthew 24, Mark 13 and Luke 21 is interesting. What is in the air and sky that has power? Space station. Satellites in orbit. Planes, cell towers, television signals, radio waves. Electrical wires. Skyscrapers. There will be no visible sunlight or moonlight, and stars (meteorites ?) will fall to earth. Volcanic eruptions caused many months of darkness in times past; that could happen again. The very atmosphere will be different. Will the air still be breathable? Shaking of the entire planet will occur, as well as demolition of the elements — that word elements actually means order. Anything constructed will be de-constructed. Men will be in great anxiety and anguish over what is happening in the skies and oceans. To survive in the next planetary form, human beings may need to evolve considerably. They may need God’s genetic makeup in their very cells. Jesus told the disciples that this “generation” (sometimes translated race) will not pass away until all these things have happened. Generation? The word is genea, from which we get genetics. He said that heaven and earth will pass away, but his words will not. He is the Word – the communication of God – and his spirit inhabits, genetically alters, certain human beings. Human beings who thus may survive, and thrive, on a reconstituted planet, to which one day Creator God will move his headquarters, and occupy space within his creation alongside the beings he created. It is fascinating to suppose.